Modern biographers have sought to rescue George Washington from his monumental stature by revealing a lively and conflicted man within. In the latest and best of these recent attempts to humanize the great man, Ron Chernow offers a “real, credible, and charismatic,” a “vivid and immediate,” and, best of all, a “hot-blooded” Washington. Chernow insists that the father of our country began as a “deeply emotional young man who feared the fatal vehemence of his own feelings” and struggled to “conceal the welter of stormy emotions inside him.” Earthy, passionate, and ambitious, Washington even told an occasional lie. An accomplished biographer, Chernow seeks to enliven the past for a broad readership. In his long book, though, he digresses too often and sometimes too long. It is certainly amusing to encounter Washington’s egotistical and berating mother, Mary Ball Washington, who felt neglected no matter how hard her son tried to impress her and attend to her: he may have been first in war, first in peace, and first in the hearts of his countrymen, but he ranked last to his own mother. But this joke, funny at first, withers in the retelling, as this one-note harridan appears over and over again in Chernow’s narrative. Washington’s flirtations with stylish, younger, but married women also get far more play than they warrant, given that they never transcended “some saucy banter and teasing pleasantries.” Instead he married Martha Dandridge Custis Washington, who reappears as the same genial, saintly companion on page after page. And we read nearly as often of Washington’s rotting teeth and clumsy dentists. Good wife, hot friends, bad teeth, and worse mother: these constitute Chernow’s ways of humanizing our Father. They all warrant attention, but enough is enough. Fortunately, Chernow moves beyond the humanizing to get at a bigger, more heroic story—in equal parts grand and tragic. Throughout his life, Washington struggled to discipline his passions in search of perfect self-control. Determined to impress people, he cultivated a distant majesty and stoicism that revealed little, while slowly taking the certain measure of others. “Be courteous to all but intimate with few,” he advised a nephew. A Continental Army officer noted that “the dignity of his presence, large and manly, increased by [a] steady, firm, and grave countenance and an unusual share of reserve, forbidding all familiarity, excited no little reverence in his presence.” By mastering self-control in public, Washington became revered by thousands, but he was truly known by almost no one, save perhaps Martha. Unwilling to let down his guard, he made only one other close friend—Henry Knox, a fellow general—and eventually would cast even him aside. By perfecting his reserve, Washington paid a chilling price in suppressed emotions (until they occasionally erupted) and in a lack of consoling bonds with others. In duty to us, he made himself the loneliest of men. Washington grew up as a colonist in Virginia, on the trans-Atlantic margins of the British Empire. As the owner of nearly fifty slaves and ten thousand acres, Washington’s father belonged to the gentry that governed the colony. Almost all that wealth was destined for Washington’s older half-brother, Lawrence, who named his new mansion Mount Vernon in honor of a British admiral with whom he had served in the Caribbean. But Lawrence died young, and the wealth passed to George, who became richer still by marrying Martha Custis, a dowdy but rich widow. “Would Washington have ever been commander of the revolutionary army or president of the United States, if he had not married the rich widow of Mr. Custis?” John Adams later wondered. You can’t always get what you want, but if you try sometimes you just might find you get what you need. Driven by ambition, Washington longed to impress the royal governor, Robert Dinwiddie, by becoming an officer in the Virginia militia. Tall, powerfully built, and perfectly poised, young Washington looked the part of a commander, especially when mounted. But he botched his first campaign. Sent in 1754 to dislodge the French from a new fort at the forks of the Ohio River in western Pennsylvania, Washington ambushed a French patrol, killing the officer. Alas, the young commander became trapped in a ramshackle camp badly sited in a swamp. Forced to surrender, he signed a humiliating confession of misdeeds and limped back to Virginia. But he remained the governor’s favorite, and the British leaders were too bent on war with France to disavow the mission, however mismanaged. Chernow posits a premature American longing for independence. A staple of popular histories, the inevitable, looming revolution entangles his narrative in hoary stereotypes. He casts all the British commanders as arrogant, supercilious twits who disdain colonists for no good reason while foolishly fighting in a European fashion despite the American woods. Braddock did exactly that; but other, more able generals led the imperial forces to remarkable victories that, by 1763, had conquered French Canada and precious islands in the Caribbean in an unprecedented global triumph for a European empire. And these generals often had good cause to curse colonists who cooperated only if they were well paid. Chernow also derides “arrogant British merchants,” when, in fact, many seem put upon by their feckless colonial debtors—including Washington. By taking the British more seriously, we could recover the true drama of the revolution: it was a surprising and painful divorce after a long and prosperous relationship. Washington came out of this late colonial war at least as frustrated by his fractious fellow colonists who cited liberty as a mandate to smuggle with the enemy and to desert from the military. Chernow astutely remarks that his early military experience “made him a believer in a strong central government and a vigorous executive.” But the British Empire began to seem too powerful during the late 1760s and early 1770s, when Parliament insisted on taxing the colonists for British revenue. The empire needed the money to fund its enlarged overseas garrisons and its inflated national debt, but infuriated colonists claimed the rights of Britons to pay taxes only when levied by their own elected assemblies, such as the House of Burgesses. In the fall of 1774 and the spring of 1775, Washington helped to represent Virginia in the inter-colonial conventions known as the Continental Congress. A fellow delegate, John Adams, soon wearied of the prolonged, showy speeches: “Every man in it is a great man—an orator, a critic, a statesman, and therefore every man upon every question must show his oratory, his criticism, and his political abilities.” But of course, the wordy and needy Adams did more than his fair share of the posturing. In a conclave of showboats, Washington stood out for his laconic dignity—which won the respect of the talkers. A Connecticut delegate declared, “He seems discreet and virtuous, no harum-scarum, ranting, swearing fellow, but sober, steady, and calm.” His swearing would come later. In April 1775, fighting erupted between British regulars and the colonial militia in Massachusetts. Compelled to act, Congress chose Washington to command the new Continental Army organized to drive the British from occupied Boston. In addition to looking the part, Washington came from the most populous and powerful colony, which was essential to winning the war. But what did winning mean in the spring of 1775? Still loath to declare independence, the colonial leaders hoped to compel a reconciliation without British taxes or troops. And that was much easier said than done, given that the colonists had to create an army and a navy from scratch to fight against the veteran troops and sailors of the world’s greatest empire. Elevation to that high command was, Chernow explains, “both a gratifying and a terrifying moment” for Washington. He quietly delighted in the respect shown by the appointment, but he dreaded the almost impossible challenge of resisting the mighty empire. While keeping up a bold front in public, he privately told Patrick Henry, “Remember, Mr. Henry, what I now tell you: from the day I enter upon the command of the American armies, I date my fall, and the ruin of my reputation.” Nothing mattered more to Washington than his reputation—which he feared losing in a cascade of defeats. His men were slow to get the message. In the winter of 1775 - 1776, a massive brawl by one thousand men erupted as Massachusetts troops battled riflemen from Virginia. One participant recalled “biting and gouging on the one part, and knockdown on the other part with as much apparent fury as the most deadly enemy could create.” An infuriated Washington rode up, dismounted, and “with an iron grip seized two tall, brawny, athletic, savage-looking riflemen by the throat, keeping them at arm’s length, alternately shaking and talking to them.” Terrified by this display, the rest of the brawlers broke and fled “at the top of their speed in all directions from the scene of the conflict.” Washington had taken command, and he would make a national army if he had to choke every soldier in it. That resolve helped to push Congress into a belated declaration of independence in July 1776, elevating the war to a crusade for national survival. The improvisation included his own performance as a leader. No longer could he afford to remain the aloof and laconic back-bencher. Instead, he had to inspire men with his words as well as his extraordinary courage under enemy fire. With a new eloquence, he assured his troops: “The time is now near at hand which must probably determine whether Americans are to be free men or slaves ... The fate of unborn millions will now depend, under God, on the courage ... of this army.” And he had to share in a measure of their suffering, for the Congress and the state governments left the men unpaid, starving, and ragged. More often than not, Washington had to retreat, saving his army to fight again another day. During the summer and fall of 1776, the British forces routed Washington’s dwindling army, driving the ragged survivors south and west across New Jersey into Pennsylvania. Many Americans and almost all Britons believed that the war was almost over. Even Washington verged on despair, privately writing to a relative, “In confidence I tell you that I never was in such an unhappy, divided state since I was born.” But he kept up a brave front to rally his troops for a last desperate counter-attack. At Trenton on Christmas night, they surprised and captured a garrison of Hessian mercenaries in the British service. Slipping away from a British counter-attack, he struck and defeated another enemy force at Princeton in early January. Together, the Trenton and Princeton victories served notice that the revolution would survive so long as Washington could hold the Continental Army together. Although Washington made his share of tactical mistakes, no general on either side more clearly recognized the social context and the political stakes of the war. No one else could have kept the Patriot cause alive long enough to win. Washington longed to create a professional army on the British model, deeming “their system as near perfection as in any other service.” A beloved myth insists that Americans won by shooting from behind trees at easy red-coated marks crowded in open fields. Would that it had been so easy. On the contrary, the British had their share of forest fighters—particularly Indians and Loyalists—while Washington trained his troops to fight in open fields with the bayonet. With the help of a Prussian drill officer, the so-called Baron von Steuben, Washington got his wish by 1778. At last, in 1781, Washington won the decisive victory that had so long eluded his battered army. Three years before, the French had entered the war as American allies in hopes of settling old scores with their traditional foe, the British Empire. The Franco-American alliance at last bore fruit in September when a French fleet blocked the British army of Lord Cornwallis at Yorktown in Virginia. Meanwhile, Washington led his Continental Army and a French army under General Rochambeau south from New York to Virginia to complete the trap. Cornwallis’s surrender deflated British morale, undercutting support in the mother country for prolonging the war. Although deeply admiring of Washington’s character and accomplishments, Chernow refreshingly avoids the hagiography that mars so many other biographies of Founding Fathers. In the end, Chernow’s case for Washington’s greatness is more persuasive because it is so judicious. He rightly insists that there would have been no ultimate victory at Yorktown without Washington’s patient management of his little army through the long war. 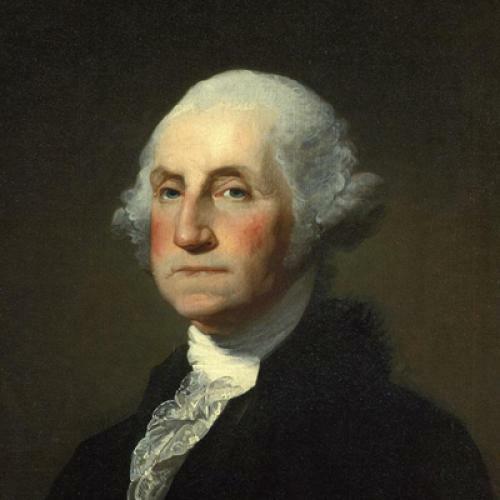 He was, Chernow concludes, “the one figure who kept it together, the spiritual and managerial genius of the whole enterprise.” And his fellow Americans recognized Washington’s indispensable leadership. A French army chaplain marveled that “through all the land, [Washington] appears like a benevolent god; old men, women, children—they all flock eagerly to catch a glimpse of him when he travels and congratulate themselves because they have seen him.” And that veneration grew in 1783, when American diplomats clinched the military victory with a peace treaty that secured independence within generous boundaries: north to the Great Lakes, west to the Mississippi, and south to Florida. To reiterate his own subordination, Washington traveled to Congress to submit his resignation before returning home to Mount Vernon as a civilian. During the war, the British king, George III, had doubted that Washington would peacefully give up the power of his army: “If he does that, he will be the greatest man in the world.” By resigning, Washington certainly confirmed his status as the greatest man in America. By walking away from power, he ensured that the American republic would not fall into the hands of a dictator, as had been the fate of Caesar’s Rome and Cromwell’s England. During the war, Washington had struggled against the indifference of state politicians and comfortable civilians who kept his army in rags and near starvation. After the initial enthusiasm of 1775 - 1777, most Americans hoped that someone else would fight and win the war for them, so that they could tend to their farms, shops, and stores. The worst of them engaged in currency speculation and profiteering in military contracts. Appalled by the suffering of his army, Washington “composed numerous screeds against American greed that make uncomfortable reading for those who regard [the revolution] as a purely heroic time,” Chernow writes. In the summer of 1787 at Philadelphia, he joined other nationalists in crafting a new federal constitution that created a potentially stronger central government led by a president. And after two-thirds of the states ratified, it was a foregone conclusion that the Electoral College would unanimously choose Washington as the first president. As with the invitation to command the Continental Army, he felt torn. He welcomed the honor, and felt duty bound to assume the responsibility; but he cherished his extraordinary reputation, which would inevitably be scuffed by the slings and arrows of politics. In accepting the presidency, he felt like “a culprit who is going to the place of his execution.” He had no idea how bad it would become. Current reverence miscasts the Founding Fathers as united in creating the perfect frame of government. In fact, they divided and fought rancorously over the proper form for the still inchoate national government that was suggested, rather than defined, by the brief and often ambiguous Constitution. Led by Alexander Hamilton, the secretary of the treasury, and John Adams, the vice president, the Federalists pushed for the strongest possible national government. They faced increasingly angry opposition from the Republicans, led by Thomas Jefferson, the secretary of state, and James Madison, the speaker of the House of Representatives, who favored states’ rights. When the British and French resumed their global warfare during the 1790s, the two new American parties also clashed over foreign policy. The Federalists tilted toward Great Britain, while the Republicans endorsed the radical revolution that had created a volatile republic in France. The Federalists denounced their opponents as anarchists, while the Republicans accused their foes of being crypto-monarchists. Friendships collapsed; duels and canings proliferated over the exchanges of insults. A staunch nationalist, Washington favored the Federalist foreign policy and domestic program, which included founding a national bank and levying taxes to fund the public debt and a small army and navy. None of that seemed worth the cost to the Republicans, who also derided as regal the highly formal style favored by the president in his receptions. At best, they considered Washington a doddering old fool, taken in by the cunning Hamilton. At worst, they hinted that the president was in on the plot and longed to wear a crown. The abuse took a toll on Washington, who longed to preserve his aura of perfection by rising above the political fray. Instead his volcanic anger increasingly burst through the painfully constructed façade of perfect self-control. Jefferson reported that the president “got into one of those passions when he cannot command himself; ran on much on the personal abuse which has been bestowed on him.” Fortunately for Jefferson, Washington did not yet know that his secretary of state was covertly funding a newspaper that vilified the president. Despite his formidable accomplishments in consolidating the new government, Washington was disgusted by the infighting, and after two terms in office he retired from the presidency, leaving its miseries to Adams. In retirement, Washington struggled to revive his lagging plantations and to cope with throngs of gaping and freeloading visitors. But he could never fulfill his vow to stay out of politics, as he denounced Jefferson and the Republicans as pro-French partisans bent on subverting his hard work for a strong national government. In 1798, Washington even agreed to come out of retirement to command an American army prepared to fight a supposed French invasion and to suppress any domestic trouble-makers. That crisis blew over just before Washington died on December 14, 1799, unwittingly fulfilling his joke that he would never live to see the next century. Jefferson refused to attend a memorial service held for the first president in the Senate chamber. In his last, and perhaps his greatest, accomplishment, Washington freed his slaves and set aside funds to educate the young and to support the old. Chernow frankly and eloquently explores Washington’s lifelong entanglement in slavery. His high social and political standing depended on the wealth generated by the slaves who worked his fields and tended his home. As a master, Washington strove for a relatively higher standard, whipping less often and providing better housing, diet, and medical care than did most planters. When selling or buying slaves, he avoided separating husbands from wives, and mothers from young children. As commander of the Continental Army, Washington initially wanted to exclude free blacks from service. But he quickly relented, given the shortage of white recruits and his fear that insulted blacks would enlist instead with the Loyalists. By the end of the war, five thousand blacks would serve in the Continental Army, which Chernow rightly calls “the most integrated American fighting force before the Vietnam War.” Given the narrow margin of victory, Washington’s common sense in recruiting blacks proved pivotal. Unlike so many of his fellow planters, Washington was more pragmatic than racist. Open to new possibilities, he welcomed the black poet Phillis Wheatley to his headquarters outside Boston. His courteous reception and praise for her pious and patriotic poems stood in marked contrast to Jefferson’s snide dismissal of her work as supposed proof of the inferiority of black intellect. After the war, African Americans and their foreign sympathizers expected the new republic to abolish slavery, at least by gradual steps. After assisting the revolution in arms, the Marquis de Lafayette declared that “I would never have drawn my sword in the cause of America if I could have conceived that thereby I was founding a land of slavery.” The northern states did slowly adopt laws that, over a generation, freed their slaves, and Virginia allowed masters to do so—if they chose. Washington planned eventually to free his slaves, but he could never dispense with their labor on his plantations, which barely funded his increasingly expensive household. Chernow laments that Washington’s “failure to use the presidency as a bully pulpit to air his opposition to slavery remains a blemish on his record. He continued to fall back on the self-serving fantasy that slavery would fade away in future years.” But it continued to expand westward, and to generate ever greater profits for most slaveholders who clung to the system with increasing defiance. In defense of slavery, Southerners rejected Washington’s nationalism in preference for Jefferson’s doctrine of states’ rights. In our times slavery is dead, but states’ rights persists in our voting returns. Its champions make much of their reverence for the Founding Fathers. Little do they realize that they have chosen one side in a bitter founding debate over radically conflicting visions for the country. Washington suffered too much from the irresponsibility of state governments to wish to see their power bolstered at the expense of the nation. If we do proceed to weaken the center, we should at least exempt our greatest Founder from any of the blame. Chernow’s book rewards its readers with an epic tale of true greatness and enormous self-sacrifice. He persuasively casts Washington as the most extraordinary man of his revolutionary age—and perhaps in our nation’s history. But while celebrating his hero’s achievements, Chernow also highlights the tragic personal costs paid by a man who suppressed his emotions and foreclosed his friendships to lead a new nation. We remember how Abraham Lincoln suffered for our national sins, but we have forgotten that George Washington sacrificed himself to become the indispensable man in achieving our republic, our independence, and our union. Alan Taylor is a contributing editor for The New Republic. This article ran in the February 3, 2011, issue of the magazine.